Make Any Room More Comfortable... & More Attractive... With This High Quality Ceiling Fan from Induxpert! Induxpert's 52-Inch Ceiling Fan With Five Wood Blades and LED Light Kit delivers excellent performance AND an attractive design. This hanging ceiling fan features a bronze canopy and motor housing and Red Mahogany Paint-Finished wood blades that look good in any room and it produces maximum air flow to keep residents cool. A whisper quiet motor that allows you to reverse the direction of the fan blades with the simple flick of a switch! Complete LED light kit. LED lights are brighter and last longer than traditional incandescent light bulbs. The light kit includes a frosted white glass light bowl. You can use the light kit with incandescent bulbs less than 120W as well. LED bulbs are conveniently included with the fan. 5880 CFM, which is much more than the 4800 or 5100 CFM of comparative models - giving you much greater airflow efficiency! An easy-to-follow instruction manual that makes installation a breeze! You'll use this fan all year! In the warm months, you can run the fan in a counterclockwise direction to produce downdraft and stay cool. Then in the colder months, you can run it clockwise to produce updraft and re-circulate warm air from the ceiling to cold spots. Simply click add to cart to get your 52-inch ceiling fan today. Try this fan for 90 days - if you don't love it, you can return it. Your purchase will be backed by a 30-day money-back guarantee and a limited one-year warranty. REVERSIBLE FAN - Change the direction of the spinning fan blades with the flick of switch. You can have this hanging ceiling fan provide downdraft in the summer and updraft in the winter. The five fan blades are perfectly pitched to circulate air so that you stay cool in summer and warm in winter. POWERFUL AIRFLOW - This 52-inch mechanical fan delivers 5880 CFM - much more than the 4800 or 5100 CFM of comparative models. This is important because CFM is key to determining a ceiling fan's airflow efficiency with no added noise. The reliable fan motor is also protected against manufacturing defects or faulty materials for a period of 1 year under the unit's warranty certificate for household use. THREE SPEEDS - This convenient fan has three speeds (high/medium/low) that you can easily control with a remote control so that you can quickly and easily change fan speeds. Now you can just push a button thanks to this easy-to-use remote-controlled fan. 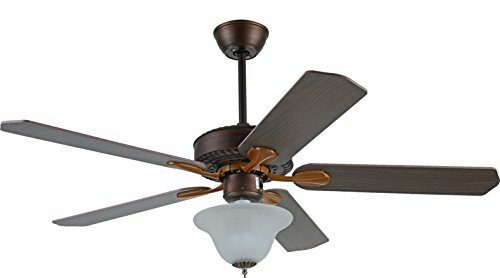 CHIC APPEARANCE- The bronze canopy and motor housing and the red mahogany paint-finished wood blades combine to produce a rustic feel that looks good in any room - bedroom, living room, dining room, great room or wherever you need to improve air circulation this fan is the perfect choice. Try this fan for 90 days - if you don't love it, you can return it. BRIGHTER LIGHT - While lesser fans rely on incandescent light (120 Watts) this cooling fan comes with 3 LED bulbs with a total 15 LED Watt capacity (=180 incandescent) & LED light bulbs included! LED lights last longer and are brighter than incandescent light bulbs. Our light kit also features a frosted white glass light bowl that will look great in any room. This mounted fan (including the blades, body and light kit) is easy to install and comes with step by step instructions to ensure success.